Mutants are natural variations that occur due to spontaneous genetic changes or the expression of recessive (hidden) genes through inbreeding. Common mutations in big cats are albinism (pure white), chinchilla (white with pale markings), leucism (partial albinism/cream) and melanism (black). White lions, also known as blond lions, are not albino, but are leucistic and are uncommon in the wild as they lack normal camouflage. In the past, the obvious reaction to any unusual big cat was to shoot it for the trophy room. Mutations may have been wiped out before the genes could be passed on. Colour mutations that would disadvantage a wild big cat are now perpetuated in captivity for the sake of curiosity or aesthetics. Accounts of white lions have been around for centuries in Africa, but have often been dismissed as superstition. It has been part of African folklore since prehistoric times and according to legend white lions were children of the Sun God, sent to earth as gifts. Oral traditions recalls the appearance of white lions over 400 years ago during the reign of Queen Numbi in the region now known as Timbavati. A shining star was seen to fall to the ground, but when Queen Numbi and her people approached, they found it to be a shining ball of metal, brighter than the sun. Queen Numbi, who was an elderly and infirm woman, was swallowed by its light and received by strange beings. When she emerged again, she had been restored to health and youth. The fallen star remained there for some days and then rose back into the sky. Animals with strange deformities were born in that region - cattle with 2 heads, white impala and green-eyed white leopards and lions. To this day, white animals are born in Timbavati, including a blue-eyed albino elephant that was shot by white hunters. Whether or not you believe in visiting spaceships, it is now known that radiation can cause mutations such as those described. White lions were central to an April Fool's joke in 1860. Late in March of that year, numerous people throughout London received a plausible looking invitation saying "Tower of London - Admit Bearer and Friend to view annual ceremony of Washing the White Lions on Sunday, April 1, 1860. Admittance only at White Gate. It is particularly requested that no gratuities be given to wardens or attendants." By twelve noon on April 1, a large crowd had gathered outside the Tower of London in accordance with the invitation. Lions hadn't been kept in the tower for centuries; the Royal Menagerie having outgrown the tower and become the Royal Zoological Society's "Gardens" in Regent's Park). There were no captive white lions until late in the 20th century. On realising the joke, the disappointed crowd eventually dispersed. An alternative explanation is that the recessive gene for white/blonde is part of the lion's genetic heritage from the days when lions roamed far more widely. Their habitats included snowy and desert regions where blonde and white colours give better camouflage than tawny and the more successful pale colour morph would come to predominate in such places. While accounts of white lions have been around for centuries, they were dismissed as superstition. There are now around 300 white lions in captivity and they have been returned to the wild. However, like white tigers, they are an attractive man-perpetuated mutant strain rather than an endangered species in their own right. The New York Times index for 1980 states "Stanley Creighton, owner of King Kong Zoo in Tampa, reports birth of three white lion cubs, which may be first of their coloration born in captivity in U.S. (S), Ag 25, 19:1. White lions were exhibited in the USA in 1993 at Philadelphia Zoo. The zoo exhibited two females obtained from Johannesburg Zoo along with two tawny males carrying the white gene. Philadelphia Zoo used the white lions to attract the paying public, but at a genetic price to the white lions themselves. 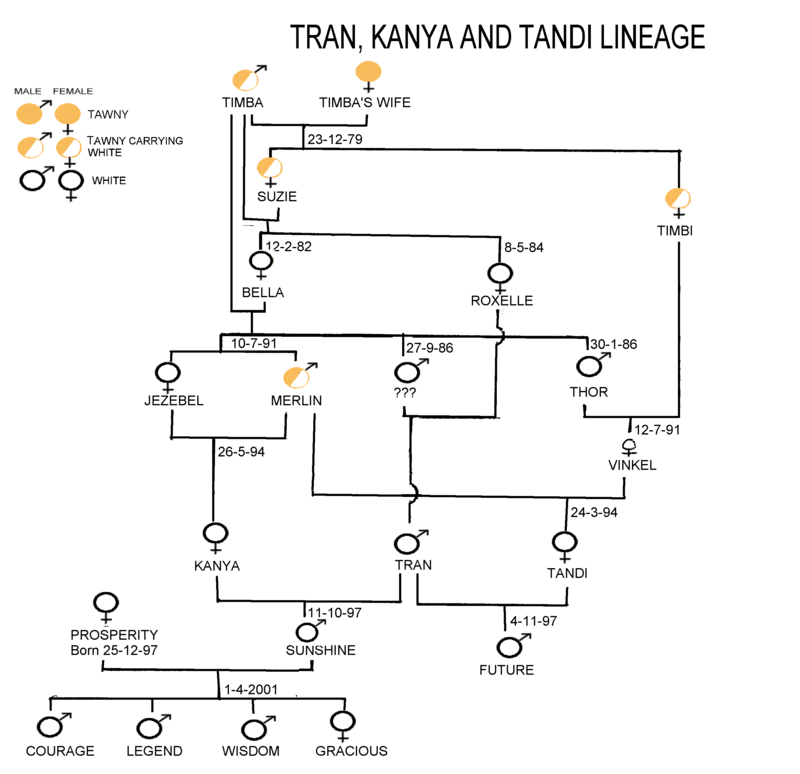 Kanya, born in May 1994, was born to a brother-sister mating. The father of the brother and sister is also their grandfather and great-grandfather. Timba, the male in question, had been bred to an unknown female in Johannesburg in the 1970s, then to his daughter and then to his daughter/grand-daughter Bella from that mating. All white lions in captivity can trace ancestry to the Timba-Bella mating, a level of inbreeding not found in the wild where young males are ousted from the pride where they were born. In 1995, white female Sarmoti and tawny carrier male Shaka, from Johannesburg Zoo joined the breeding programme of Las Vegas stage magicians Siegfried and Roy. Like white tigers, white lions are showy animals for use in their stage acts. At that point, there were fewer than 10 white lions recorded worldwide. By September 1996, Siegfried and Roy had 7 white lions. 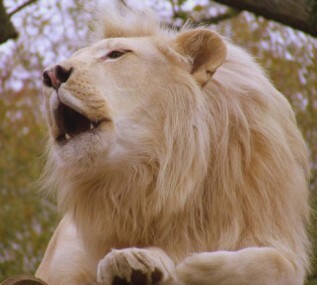 Descendants of their white lions, bred at Fritz Wurm's Safari Park in Stuckenbrock in Germany, are white lionesses, Tandi and Kanya (born to the Philadelphia white lionesses Vinkel and Jezebel), and the Philadelphia heterozygous tawny male Merlin. When Tandi and Kanya went to Germany, Siegfried and Roy acquired a white male called Tran from Japan as a mate for them; Tran is somewhat darker in colour. Kanya became the mother of Sunshine (male), and Tandi became the mother of Future (male), both acquired by Siegfried and Roy and on permanent loan to Cincinnati Zoo, along with Prosperity (female), a white lioness born in Las Vegas. They went to Cincinnati in 1998 and are exhibited as "The White Lions of Timbavati" along with Millennium. Prosperity had 4 cubs (3 male, 1 female) in 2001. The female remained at Cincinnati while 3 males went to Toledo Zoo on loan in 2003. The family tree can be found at the link below. There are white lions at Ouwehands Dierenpark, Rhenen in the Netherlands and one at Olmense Zoo in Bukenberg, Belgium. Toronto Zoo's white lion apparently came from Philadelphia Zoo. In the summer of 1998 white lioness Nakanda became queen of the African Savannah. She was born in Philadelphia in 1996 and loaned to Columbus Zoo, along with her two heterozygous brothers, Tombo ("Clover") and Tonyi ("Charmer"), in 1997. The first offspring of Nakanda was a heterozygous male named Simba, who went to Parc Safari. Philadelphia's white lion pride was loaned to Columbus from August, 2004 to May, 2006, while Philadelphia constructed their new exhibit called Big Cat Falls. White lions from the different strains are now being brought together by the Zoological Animal Reproduction Center which holds 2 white lions (one from each strain) and 5 tawny carriers of the white colour (also from the 2 different strains). These are being bred together to increase the genetic diversity of captive white lions. To produce white individuals requires inbreeding and, if not carefully managed, this also leads to inbreeding depression (other deleterious traits, including infertility and manelessness in males, start appearing). There is reportedly a third white lion bloodline that comes from a white male captured in the Timbavati area in the late 1980's and kept by a private reserve, but it may be part of the original Timbavati bloodline. There is an unrelated strain of white lions at the Johannesburg Rhino And Lion Park, which was founded by a white cub discovered in the wild in the park. Thandile was spotted in July 1999 by a visitor to the Rhino and Lion Nature Reserve north of Krugersdorp. She had been abandoned by her mother and the visitor alerted two game wardens who retrieved the cub. Thandile was hand-reared. Ironically, the colour that would make her less effective in the wild had made her more visible to a person able to save her (it could just as easily have made her more visible to hyenas). Thandile has blue eyes, but is not albino. In 1998, a half-eaten white cub had been found in the Rhino and Lion Reserve. More white lions have been born in the Kruger National Park as the pride that produced the Timbavati white lions spent as much time in Kruger National Park. There was also supposedly an albino lion living in Kruger at one time. At present, all of the white lions come from the Kruger park subspecies and have not been bred with any other lion subspecies (unlike the comparable situation in white tigers). 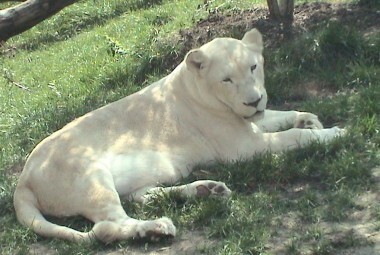 An exception is the white lion at Toronto zoo which has been bred to a generic male. Unlike normal lion cubs which are born spotted, white lions are born almost pure white. Over the months, their colour gradually darkens to cream or ivory colour. In addition to the white bloodlines, four white lion cubs were born at the Papanack Park Zoo outside Ottawa, but did not remain white. A white cub was born at an African Lion Safari in Florida years ago and also did not remain white. A brown-eyed white lion cub was born at the East London Queen's Park Zoo in South Africa. Two white lion cubs were recently born at Bifengxia Zoo, in China (there are now about 10 white lions in China). Taiping Zoo in Malaysia also has white lions. White lions in Japan are kept by Tohoku Safari Park Toronto Zoo's white lion, Nokanda ("Lucky") (possibly from Philadelphia Zoo), has been paired with a lion of mixed blood and has produced at least one litter. The first white lions in Australia were Magigwana (Great Lion Warrior) and his two female companions, Nkungwe (Mist) and Jubulani (Happiness) who went from Johannesburg to Mogo, Australia as part of a breeding programme. The long-term aim is to return any progeny to Timbavati and re-stock the original population so that white lions once again occur naturally. A tawny coloured lion from Mogo's own pride will be mated with the females and the progeny will return to Africa. There will not be any breeding of white lions for zoos in Australasia, however Taronga Zoo in Sydney, Australia obtained white lions from Mogo Zoo. There is also a white lion breeding progamme at Zion Wildlife Gardens, Whangarei, New Zealand where there is a male named Gandor (acquired 2004) who was later joined by 3 white lionesses; Laduma, Amafu and Imvula. Athens zoo, in Greece, also has white lions. In Jan 2005, two white and one "brown" lion cub were born at the East London Zoo in South Africa. Britain's first pride of white lions went on display in 2007 at the "Kingdom of the White Lions" exhibit at West Midlands Safari Park in Worcestershire. The 4 lions were obtained from Kruger National Park, in South Africa and are 16-month-old male Mubuto, his sister Natasha, their 15 month old half-sister Johanne and an unrelated 19 month old female, Maryn. Two of the white lions are directly descended from Tombi. Two new white lion cubs were born at the west Midland Safari Park in England in 2007. 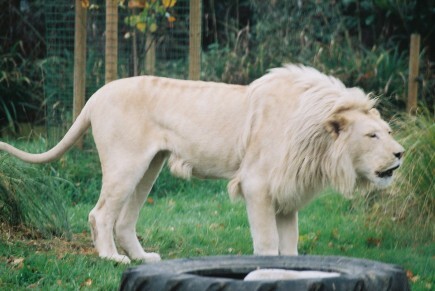 A second pair of white lions in Britain went to the Paradise Wildlife Park, Broxbourne, Hertfordshire, however their 2 year old White lioness, Nala, was put to sleep in June 2007 due to a severe spinal abnormality. Vertebrae in her back nicked her spinal cord and caused paralysis in her hind quarters. Nala had arrived from South Africa in October 2006 with mate, Thabo, and had only been on public display since coming out of quarantine in March 2007. Four white lions - 3 female, 1 male - were born at Jurques Zoo in Normandy, western France in 2007 to white lioness Nyala. The cubs are being hand-reared as their mother was neglecting them. In the USA, the AZA policy since 2009 regarding big catsmeans that zoos are no longer allowed to breed generic lions (mixed sub-species lions), including white lions. AZA zoos are forbidden to breed them, or to replace them when they die, or to acquire new ones or even get cubs on loan. Those that are transferred out of an AZA zoo to a non-AZA zoo must be spayed or neutered prior to the transfer. They are permitted to live out their lives in AZA zoos, but many have been spayed or neutered. That leaves only the non-AZA zoos and private owners as possible homes for them, but there are numerous attempts to pass laws, both at the state and federal level, forbidding anyone other than AZA zoos to have big cats, which would leave white lions nowhere to go in the USA. The four-generation Philadelphia dynasty has all but died out by 2018. The three male lions at Toledo have all died, as have the two male lions at Cincinnati. The only two remaining white lions are the two females at Cincinnati, mother and daughter (Prosperity and Gracious), both spayed and both elderly. The mother close to the end of her life, and the daughter will be relocated to another facility. This is unfortunate, because white lions are a naturally occurring colour morph, but those in zoos often originated from circuses or stage acts and are not genetically pure. While most people are content to see and photograph white lions in zoos or, if lucky, in the wild, some of the sicker examples of the human race pay around $200,000 to shoot a captive white lion. South African author Linda Tucker details canned hunting in her book "Mystery of the White Lions - Children of the Sun God". The canned hunt industry is controlled by tight syndicates that exclude outsiders from facilities where lions are bred to be killed. Footage of lions bred for canned hunts at Timbavati show them to have defects due to inbreeding and confinement: bone defects, missing tail tufts, hinquarter paralysis and, in one individual, an open wound on the forehead that resembled a bullet hole. According to Tucker, some cubs bred for canned hunts have required open heart surgery at Onderstepoort Veterinary Hospital, indicating a damaging level of inbreeding. Those cubs got treated just so they could survive to adulthood and be shot. The hunters are mainly foreign tourists who want a white lion trophy. The lion is penned in a small enclosure and the trophy-hunter shoots it from behind the fence. Being used to humans, the lions may go to the fence to investigate their visitors. Many of the hunters have no experience of killing and shoot the captive lion several times before it dies. Textual content is licensed under the GFDL.